It recently came to my attention when a friend asked me for some tech support regarding installing RMXP for the first time on his Windows 7 computer. When he installed the program and RTP, he encountered an "RPG Maker XP has stopped working" error. Open Control Panel and click on System & Security, then click System. 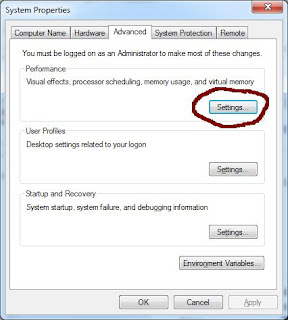 Click on Advanced System Settings in the left-hand panel. This will bring up the "System Properties". This will bring up the Performance Options. Click on the Data Execution Prevention (DEP) tab. 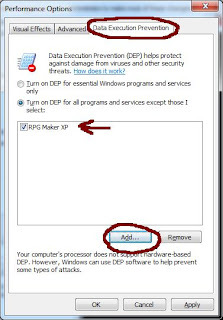 Click Add to add RPG Maker XP to the list (making sure it’s checked). When you click Ok, then Ok on the "System Properties" dialog, you should now be able to run RPG Maker XP. Also, make sure that your firewall and/or virus checker recognizes it.